Hanoi (VNA) – President Tran Dai Quang on August 8 sent a letter of congratulations to Singapore’s President Tony Tan Keng Yam on the occasion of his country’s 52nd National Day (August 9). The same day, Prime Minister Nguyen Xuan Phuc also extended congratulations to Prime Minister Lee Hsien Loong on the special event. On the occasion, Deputy Prime Minister and Foreign Minister Pham Binh Minh sent a letter of greetings Foreign Minister Vivian Balakrishnan. 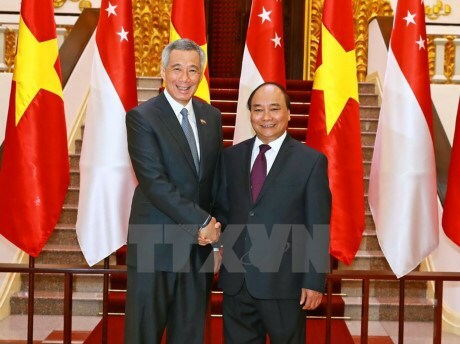 Vietnam and Singapore established diplomatic ties on August 1, 1973, and their relations have been thriving especially since Vietnam became a member of the Association of Southeast Asian Nations (ASEAN) in 1995. Singapore is currently one of Vietnam’s largest trade partners with bilateral trade revenue reaching 15 billion USD in 2016. Singapore is also among Vietnam’s leading foreign direct investors, with 1,900 projects valued at more than 41 billion USD.